In technical analysis, stock charts are similar to the types of charts that you see in any business setting. Stock charts simply present a graphical representation of a stock’s price fluctuations recorded over a set time frame. 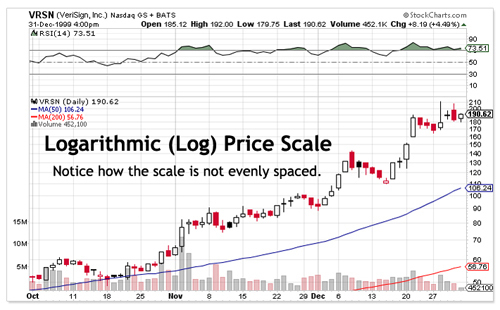 As an example of this, a chart may show a stock's price movement over a one-year period, where each point on the graph represents the closing price for each day the stock is traded. The upward or downward movements of the charted prices reflect the stock’s trend direction at that point in time. 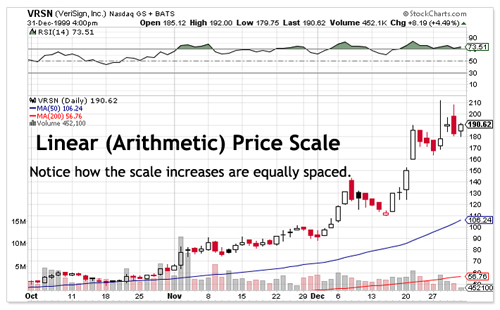 The time scale, the price scale and the price point properties used are important stock chart properties and things that you should be aware of when looking at a chart, as these factors can affect the information that is provided. The time scale refers to the range of dates at the bottom of the chart, which can vary from seconds to decades and so forth. The most frequently used time scales are intraday, daily, weekly, monthly, quarterly and annually. The shorter the time frame, the more detailed the chart. Each data point can represent the closing price of the period or show the daily open, the high, the low and the close depending on the chart used. Intraday charts plot price movement within the period of one day. This means that the time scale could be as short as five minutes or could cover the whole trading day from the opening to the closing bells. Daily charts are comprised of a series of price movements in which each price point on the chart is a full day’s trading condensed into one point. Weekly, monthly, quarterly and yearly charts are used to analyze longer term trends in the movement of a stock's price. If you have an interest in stock charts and stock charts technical analysis, you may want to consider signing up for a risk-free 14 day free trial of SmarTrend – and take the guesswork out of your trading.